What Ever Happened To Childhood? A years ago the newspaper I worked for published a photograph of two young boys, about 12 years of age, holding and admiring a new rifle one of the boy's fathers won at a raffle during a sportsman's banquet. It was a great picture of one boy holding the rifle up high and his friend looking on with obvious admiration. The photographer who shot the picture said the boys were attending the banquet with their parents, who were standing nearby, but did not appear in the picture. I was surprised by the turmoil this picture caused. We received letters and telephone calls by people in the community who expressed shock and dismay that our newspaper would "condone letting boys handle guns." One woman demanded that we print an apology and say publicly that we as a newspaper do not support this behavior. I don't think I realized until that moment just how brainwashed the public has become over this gun issue. Our critics acted as if the boys in our photograph were guilty of misbehavior because they had their hands on a rifle. These boys are sons of sportsmen. They go hunting and fishing with their dads in rural Michigan where they live. 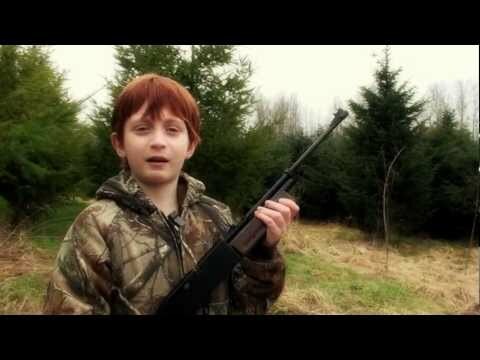 Boys in that neck of the woods learn early in life how to safely handle firearms and we never hear of them shooting each other or their parents, even by accident. In the 40 plus years I wrote news stories in Michigan, I think I can recall only about two or three times when children got their hands on a loaded handgun and accidentally shot someone. Yet I doubt if there are many homes in this state that don't have at least a shotgun or a rifle packed away in a closet somewhere for hunting, target shooting or just for defense purposes. When I was a young lad, I had a J. C. Higgins .22 cal. semi-automatic rifle that took either long or short bullets in a long magazine attached just under the barrel. It was a fine weapon. You could almost load an entire box of bullets in that magazine and rarely have to stop to reload. I joined a rifle marksmanship club and not only learned how to handle that rifle, I developed skills as a very good marksman. In my neighborhood, learning to handle a rifle was part of growing up. It did not mean that we were a threat to the people around us. It was sort of an initiation into manhood. Our dads instilled in us a confidence that we were old enough to be trusted as responsible young men when we were trained to handle a rifle. But things have obviously changed. Not only because of the gun issue, but there seems to be something even more sinister afoot here. Children today have no time to just be a child. A youngster's every move, from birth until graduation from high school, is carefully orchestrated by the parents, by the community, by the schools, the church and our entire social structure. This new phenomenon of children killing children in the schools seems to be almost unique to the United States. The fact that it is happening, not only in our schools but in various other public places and that shooters are stepping from a variety of social backgrounds, has people in other countries frightened. They see us as a nation of barbarians. I suspect these events may be an attempt by our children to rebel against this constant attack against their personal freedom to simply be a kid. When you think about the carefully programmed life styles parents now pattern for the children, you might understand this pent-up anger. When I was a child, I ran free with my friends. We played cowboys and Indians, aimed and fired cap guns and water guns at each other, climbed trees, build "forts" out of junk lumber or packed snow, went on long bike rides, dipped in a local stream for tadpoles, and jumped stark naked in the ole-swiming hole if we felt like it. The only restriction I recall is having my water pistol snatched by a teacher if I was caught using it in the school. I also lost a few yo-yos, exploding cap "bombs," and pea-shooters to the evil hands of those teachers, but never had my "crimes" turned over to the local police department. I don't recall every being sent to the principal's office. Somehow I grew up unscathed by all of that freedom. In fact, I learned to love freedom so much, I have devoted my life to keeping it. There is a phrase from Crowley's "The Book of the Law" that I especially like. It reads: "Do what thou wilt shall be the whole of the law." There is two other parts to that declaration. They read: "Love is the law, love under will," and "the word of restriction is sin." What this means is that freedom to do our will is the most important possession we can have during our stay on this planet. With this freedom, as with the right to own a firearm, comes responsibility. Not only should we have the freedom to do our will, it should be our will to love and persue our will in life without restriction. If we put those ingredients together we do not go around shooting the people around us. If the children who kill are doing their will, then their sacrificial actions should be signaling that something is seriously wrong with the society that spawns them. If they are not doing their will, then it means they are controlled, or "possessed" by forces that are attempting to send what seems to be the same message. Call it demonic, alien or whatever this force may be, the message is a clear warning. Today's children are marched off to crowded day-care centers while mother works, and then enrolled in pre-school one year before they start school. They have even begun forming neighborhood "play groups," where mothers bring their infant children for supervised play with other babies during certain hours of the day. Once old enough to attend the public school, that institution controls nearly every waking moment of a child's life. Children are robbed of their freedom for self-expression. What parent today takes time out of their busy schedule to meditate, let alone teach this wonderful tool for regenerating both body and soul, to their children? And now comes this new concept of "zero tolerance," sparked by the drug hysteria and school shootings. The adult paranoia is running amuck here. This fear-based society of ours is blindly being herded like cattle into total government suppression by skilled minds using national news feeds to brainwash a large portion of society. The anti-gun propaganda is getting so blatant I find it difficult to believe the zombified masses are swallowing it. Here are some actual news clips from various Internet news outlets downloaded about two days before I wrote this report. In Somerville, New Jersey, a 12-year-old boy was charged in superior court with making terrorist threats because he drew a picture of a gun, showed it to a classmate, and said he was going to shoot her with it. The girl reported the incident to her teacher and the police were called. Three seven-year-old first grade girls in Lake Station, Indiana, were charged with plotting to commit murder after they threatened another classmate. The toddlers said they were going to shoot, hang or strangle the other student; they hadn't decided just which. The police searched the girl's homes, their school desks and bags and no weapons were found (obviously). Nevertheless, all three girls were suspended from school indefinitely. The most ridiculous story was that of a 17-year-old girl in a Newport News, Virginia high school, who was suspended from school for 11 days because she brought a pair of scissors to class. Scissors? Don't all classrooms have scissors? How do children cut shapes out of paper in art class without scissors? Perhaps they use very sharp knives. Or maybe they use handguns and cut their patterns with bullet holes.